The Samsung 9 Series laptop has a 13.3” SuperBright Plus display with 1366×768 pixels resolution and 160 degree viewing angle. Its brightness goes up to 400 nits but that’s controlled by an ambient light sensor for more comfortable viewing. The 9 Series is powered by an Intel Core i5 2537M dual-core CPU with 3MB cache. It runs at 1.4GHz but with Turbo Boost it reaches 2.3GHz, which neither the Adamo or the Air can reach. The laptop comes with 4GB DDR3 RAM and Intel HD GT2 integrated graphics. The Samsung 9 Series body is just 12.3 mm thick and made of Duralumin (aircraft-grade aluminum) making for a both tough and light construction – it weighs in at 1.31kg. Despite its slimness, the Samsung 9 Series laptop packs 2×1.5W stereo speakers and a 1.5W subwoofer and a Li-Po battery enough for 6.5 hours of work. 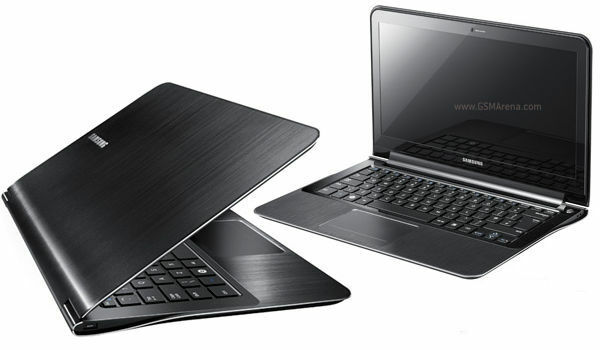 The Samsung 9 Series laptop will launch in February for $1,599.